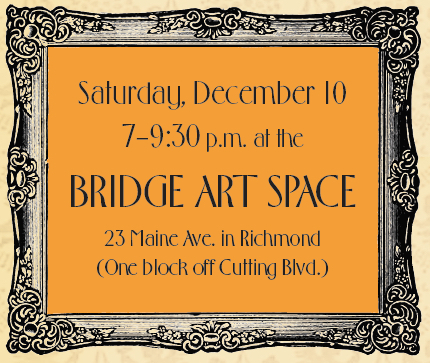 You’re invited to Saffron Strand’s 2016 Winter Gala & Silent Auction, scheduled for Saturday, December 10, 7:00-9:30 p.m. at Bridge Art Space (23 Maine Avenue, Richmond, CA). Our Winter Gala features an art exhibit and live music by the New Oak Pilgrims and Dan Damon & Friends. Enjoy wine and refreshments and a bounty of wonderful items to bid on during the holiday season. There’s a $20 entrance fee, payable at the door, or in advance through our secure payment website — click here. All proceeds go to support Saffron Strand’s all-volunteer programming to get the homeless and those at risk off the streets and back to work. Download the flyer by clicking here, or for more information, call 510.275.9594 or email info@saffronstrand.org. Buy Your Winter Gala Tickets Today! Join the Silent Auction — Art, Sculpture, Jewelry, More!